Home » Gardening » What Planting Zone Am I In? As the days get longer and the weather gets warmer most of us gardeners are itching to get outside and get our hands dirty. As spring approaches, our mailboxes are flooded with catalogs tempting us with beautiful pictures of every plant under the sun. Choosing a plant that is labeled for your zone, helps to ensure that your plant will survive the winter. Here in northeast Ohio its common to find a tropical variety hibiscus for sale at the big box stores, garden centers, and even outside grocery stores. Many people buy them to take home and plant them in their front yard. They look beautiful all spring and summer, but never survive the winter. Its very profitable to sell the same $20 tree to the same people year after year. We can bring the tropical hibiscus inside over the winter…if we have room for a small tree in our house. A better option would be buying a hardy variety, like Lord Baltimore Hibiscus, that will survive the winter here in Ohio. This is why its important to know what planting zone you are in. In 1960 the USDA came out with the first hardiness map that broke the United States into different growing zones based on 10 degree (F) differences in average low temperatures. Over the years the map has evolved to take into consideration more precise measurements, but the map still only reflects one thing: the average low temperature. 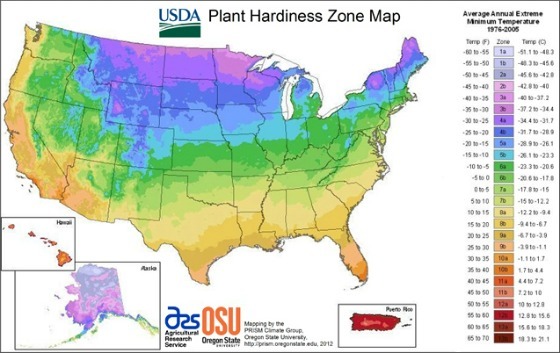 Nevertheless, plant hardiness zone maps have become a useful guideline in determining what grows where. Most plants have their zones listed on tag. The newest version of the map was released in 2012. It was compiled using weather readings from the past 30 years. The newer map has more specific results than the previous versions because of better mapping technology and many more weather observation stations. The new map takes better notice of micro-climates inside larger zones. This helps set guidelines for larger cities that (because of all the heat stored in concrete) stay warmer than the surrounding countryside or cooler temperatures resulting from higher elevations. The newer version of the map added zones 11 and 12 to represent 50 and 60 degree lows found in Hawaii and Puerto Rico. There is also an option to look up your area by zip code for more specific results. Click here to visit the USDA website. Click here to see an interactive plant hardiness map for Canada. Here are a few other useful tidbits that will help you decide which plants to grow. Heavy freeze: 24 degrees (F) and lower causes heavy damage to most plants. I would love to get in and win a free membership, cause this winter has played havoc on my hubby and I’m now out of work he had a heartatche.I have followed you all winter and had started some snowball hydrengea they now need a home and I don’t no how to get selling them sorry if there are misspelled words I got this tablet for Christmas from kids for me to keep in contact with them. Question: Large ornamental purchased at nursery in large pot, and cost 300 dollars. Tree/bush is 30 yrs old now- out of control size, afraid to trim. Need to graft to share and sell. Other plant is same variety, but was purchased grafted into bamboo trunk( less than 15 dollars), only 1 trunk, describe as stick when purchased over 15 yrs old, not growing fast not dense foliage, or spreading like large bush. How do u graft into bamboo stalk? For instance, On the smaller bush, the bamboo was well established root ball with the maple inserted into the flat cut bamboo center. Basically this plant was a mere simple stick plant 2 ft high with few branches, but it lived and is a nice specimen, but not a real beauty like our large Maple. Is the bamboo method a good option for making many new plants more quickly? How do u do this method? Have access to bamboo, just don’t know how to do. Appreciate any advice u can offer. Thanks so very much. Your site is a wealth of information and very informative. 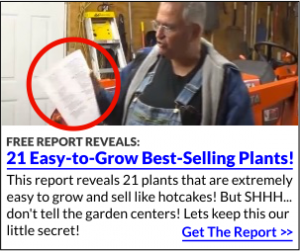 Hi Mike, I enjoy all your advice on planting which I receive on my email. I live inn New Hampshire for six months in the summer, and I live in Florida for six months in the winter. It gets confusing in many ways, but it is worth it. When you give your advice on planting, I don’t know if it will work in both of my planting zones. Is their anyway you could include that information? Even a note such as good in zones 1-5 or 6-10 would help people like me. I always look forward to reading your articles with good advice. Well, here’s the problem: By zip, I’m in zone 7b, which says the average annual extreme cold is 5F to 10F degrees. Last year our winter was more like zone 8a. THIS year it’s been like zone 5a! To top it off, we’re in the forest, 200 yards from the lake in SE Oklahoma, and the greatest portion of land is about 85% sand, 15% decomposed leaves from several varieties of trees, some that don’t allow for plants of any kind to grow within a 5 yard radius of the tree. All trees have been removed around the house to around a 40 foot perimeter. I’ve terraced the sloping yards and backfilled with a mix of good top soil and heavy dark composted soil. Most all plants I’ve purchased are zone appropriate for zone 6c, and have weathered the broad range of conditions in and around the yards and house. Last summer, we had a LONG hot spell, almost 3 months straight of 100F degrees and more. This winter we had several week long spates of -10F with wind chills of -25F, and little rain until late March. Now that it’s April, we’re rapidly seeing temps rising into the 80’s already, then just as rapidly falling back to the low 30’s. Weeds are already growing like crazy, and the trees are already leafing out, and I’m only about 1/3 done with raking and burning leaves from last year that finally were shed in late December, although there are still some on some of the trees. In short, I get about a two week window to prepare and plant my vegetables that are weather exposed, an even though I start many of my flowers inside my greenhouse, I have to be extremely watchful of the temperatures inside, as they can rapidly, within less than 10 minutes, climb from 50 degrees to 125 degrees, and just as rapidly drop again. I lost all of my tomato seedlings last year, all of my broccoli, cauliflower, and eggplant bolted, zucchini, cantaloupe, honey dew, and watermelon burned up, and most of the asparagus was heat stressed. Being in an outside garden, the cilantro, chives, garlic, and onions did a little better, but the table queen squash only bore a couple before it too burned up. Blackberry and raspberry did OK, but grasshoppers took a toll on them. Using the USDA zoning will work well for most areas, but as in my case, there is simply too much variation to rely on a single zone factor, so I must make variations from year to year and season to season. Our last frost was April 2nd! Thanks for your work on this Amber! Is there a treatment called bayed. Not sure of spelling. My tree is about 5 years old but gets a lot of sunlight, morning to early evening. Every year it starts loosing leaves at this time of years. We use bayer which is milky and add water and put around root system. Are u familiar with this treatment. . I always trim dead limbs. It looked great till the last couple weeks and have lots of dried falling leaves. Your tree could be suffering from something like apple scab which affects apples and crab apples, possibly spider mites. Bayer forumlas do work when used for the purpose they are attended. Of course I don’t know what kind of a tree you have.